In the fall of 1454, Mehmed II sent a letter to thirteen archons of the Morea, accepting their offer of loyalty to him. They were "Kyr Manuel Rallis with all his people, and Kyr Sophianos with all his people, and Kyr Demetrios Laskaris with all his people, and the Diplovatatsoi, the Kavakioi, the Pagomenoi, the Frangopouloi, the Sgouromalaioi, and Mavropapas, the Philanthropenoi, and Petro Bua and his people, and those others who want to come." All those plurals mean that each of the archons brought with him several dozen, maybe several hundred, more men, so this pledge of loyalty had the result of transferring several towns to Mehmed's service without effort on his part. and your children, and your heads, and anything of your possessions that remain to you, I will touch nothing, but I will leave you in peace so that you are better than before." After the Fall of Constantinople, which surprised no one even though it broke many hearts, the Morea disintegrated. The threat of disorder had always been there among the archons, and often happened, but at this point disorder was at every level of society and there was a general revolt -- "of the Albanians" -- the chronicles say, but Greeks revolted, too, and sometimes there were several sides revolting at once. Demetrios and Thomas Palaiologos, each ruler of half the Morea, fought each other, everyone changed sides and Mehmed was invited to send in troops to help pacify the country. The Venetians saw the general disorder as their opportunity and sent in diplomats to offer gifts, and bribes to anyone where it might be considered used -- diplomats instructed not to put anything into writing. Once they saw how things were going with the Turkish troops, they focused their attention on Thomas, who liked Italians, and later on Demetrios, but neither would make a commitment. Ever since the Fall, various archons and island rulers had been going to Mehmed, offering him homage, and welcoming him to their towns. By the fall of 1454, and given the revolts, the Morea was so totally hopeless that archons there were doing the same thing. There was a lot of it going around, but it is only these thirteen for whom we have a piece of paper. Manuel Rallis, a brutal man and a palace official of Thomas Palaiologos, was in control of the area originally called Morea -- the territory of Chlemoutzi, Clarenza, the plain of Andravida. It formerly was controlled by George and Thomas Rallis, for Thomas Palaiologos, their first cousin, but at the Fall, they left for Italy. Just how Manuel was related, we don't know, but he now had that territory as well as his own and he had put it under Mehmed's control. He must have been quickly disillusioned: Mehmed did not tolerate the independence and rapaciousness the Palaiologoi were unable to control. When Mehmed came into the Morea in 1460 -- and he took the surrender of Mistra from Demetrios Palaiologos on 29 May, the seventh anniversary of the Fall -- he brought people with him to whom he assigned lands. He used the same sort of leapfrogging method of land assignments my father and I used for turtles in the summer of 1950: find a turtle on the road, put it in the floor of the car. Next turtle is put in the car, and the first put out, and so on and so forth, four days from Minnesota to Texas, and four days Texas back to Minnesota. This is probably why most of these archons were to be found fighting for the Venetians three years later when war broke out in the Morea in the summer of 1463. By 1465, Manuel Rallis, four of his sons, and a grandson had all been killed, some brutally. The lands he had claimed were now under his son Micheli whose people complained to the Venetians about his harshness. In August 1466, Micheli Rallis was with the Venetian army when it was surprised outside Patras. The Venetian commander, Jacopo Barbarigo, fell off his mule when trying to escape, and Rallis, instead of making his own escape, stopped to help him. He was pointed out to the Turks by a priest. Barbarigo was cut to pieces. Rallis and the Metropolitan of Patras were impaled on the seashore. About the others, we have little information. Petro Bua, his sons and grandsons, were fighting for Venice in the 1480s, and when he died at home in bed, the Venetian Senate heard speeches in his honor. A Sophianos served as an emissary for Mehmed to the West, but it may not have been this one. Some went to Crete, some to Italy, and more were absorbed, one way or another, into the Ottoman system. Some probably ended up administering lands in Albania or Thrace. And for at least three generations, Venice, out of loyalty and gratitude, was providing employment and allowances and dowries for the desendants of Micheli Rallis and his brother Nicholas. Ag. Marina is in a valley behind the fortress of Kazarma, up the road from the Mycenean bridge. The chairs suggest how very small it is. It was probably built as a burial chapel -- we'll get back to that later. The next photo suggests that there was a collapse of the roof or wall at the rear -- too small to call it an apse -- so that it was clumsily, very clumsily, rebuilt. The inside has a minute narthex, with an arched entrance to the chapel. 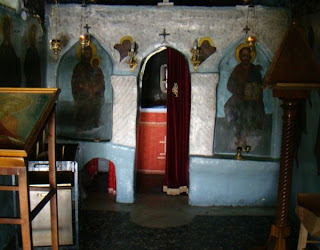 The chapel has a stone iconostasis with an arch in the center and another arch on the side. None of these three arches is symmetrical or has the same arc or height. One almost has the impression that the builders had themselves never actually seen an arch before. Thirty years ago, Ag. Marina was nearly hidden in its valley by damp green grass and shrubbery -- after rains, water came down the hillside all around it. The inside smelled of mold and the candles were too damp to light. Since then, a dirt road has been put through which channels the water away from the chapel, the grass is regularly cut, and someone keeps the paint around the front door fresh. It has acquired electricity and those chairs. It was completely frescoed but damp and age and incense and smoke have long since turned the frescos black though ghosts of images remain. Chunks of plaster have fallen off from old age, and others have fallen where nails were hammered in to support icons. Fooling around with Gimp on the pictures I tried to take of the wall brought to light a reddish robe over a white gown, possibly of Christ, and of a woman in a white dress of the kind non-Greek women wore in the 14th and 15th centuies. There is too much damage for me to say whether or not she is facing someone, but it was usual to represent an unmarried woman in white in her tomb portrait. This portrait is on the rear of the iconostasis -- not at all a conventional place for such, but that was one of the only two areas in the church with enough space. This woman in white is a tremendous addition to the historical materials of the Argolid. Otherwise, I have found only five named women in the 15th century: Soi, a serf; Kyria Malaksos, a priest's wife; Maria Buriano, defrauded in an investment; Maria de Cavaza, a land-owner, and producer and dealer in her own linen and wool business; Magdalena de Finctis, Ms. Cavaza's sister-in-law. To be so few, they are a nice variety. Six more unnamed women are mentioned in passing, and there are references to "families." Ag. Marina was most likely built as a burial chapel for a fief. 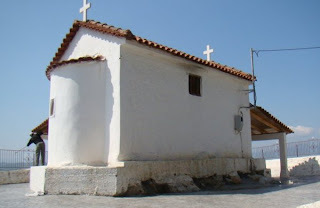 There are a number of these small chapels around the Argolid, and they will, slowly, allow us to work out general impressions of the locations of the medieval fiefs -- some of them we know had about 200 acres. But unlike medieval chapels and churches on main roads or beside towns, Ag. Marina has never been formally identified, and it certainly has not been tidied and restored. I am not much interested in disrupting its life. I like the unmatched chairs in front -- a good place to eat lunch or rest when you are hiking, or pruning the olives across the road, but I would like to see those frescos, and the fragments of the others, cleaned up and protected. Continuing a little longer with the topic of John VIII's headgear. This is Manuel Laskaris Chatzikis who died in 1445 and was buried in the Pantanassa monastery at Mistra. The inscription on the fresco identifies him as "servant of the Despot, Constantine." That is all we know about Manuel Laskaris Chatzikis, except that this image shows him wearing a style of hat that is otherwise only seen in portraits of John VIII, his brother Thomas, and their father, Manuel II. The hat is generally called a skiadion, but that is the wrong name and the right name is eminently forgettable. * Call it the Palaiologos hat, or the melon hat. Chatzikis also appears to be wearing a robe very like the one John wears in his portrait, although we can't be perfectly positive about the sleeves. There was another Laskaris in John's ambit, about whom we also know nothing, except that John sent him to Italy to help make arrangements for the Council of Ferrara-Florence. There were more Laskarids than just those two. They were a huge family, intermarried with all the other huge families, and you couldn't swing a cat in the Morea, or Constantinople either, without taking out half a dozen. But we are limiting attention just now to the coincidence of these two. The Palaiologoi were accustomed to reward individuals who gave significant service with significant contributions to their wardrobe. Sphrantzes reports that Manuel II once gave him a dark-colored robe lined with fur and a chest that had belonged to his father, while John's wife, Sophia, gave him one of her green robes for his future wife. On another occasion -- this when Sphrantzes was released nearly dead from imprisonment at Patras in a tower with mice and weevils -- Constantine gave him a double green tunic lined with fine green linen from Lucca, a red cap decorated with gold and a silken lining from Thessalonike, a heavy gold-colored caftan from Brusa, a green coat, and a finely worked sword. One might think green was the Palaiologos' special color. 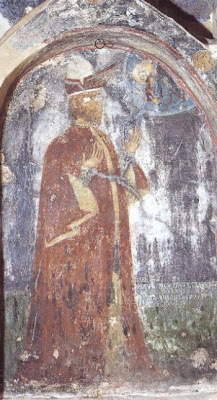 We need more evidence for this, but it may not be too much to think that in this portrait of Manuel Laskaris Chatzikis we are seeing the emissary for Ferrara-Florence, and that he is wearing John's hat and robe, a signal to the cognoscenti that he was a person of high significance, not only to Constantine who ruled at Mistra, but also to the Emperor in Constantinople. Late addition: The fact that Chatzikis had himself painted wearing this hat and robe does not mean that he actually wore them, but he might have been buried in them. 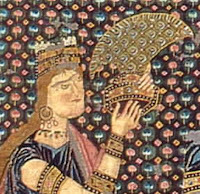 * For the sake of conscience, the name of this style of hat is kamelaukion.To my knowledge, this is not only the only non-imperial person shown wearing this hat, this is the only Greek fresco of this hat. All other images I know of this hat were painted in the West. I would be grateful for more information here. ** Go here for more information on the kamelaukion. 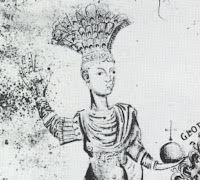 When Cyriaco of Ancona was in Constantinople, he sketched as best he could the great bronze statue of Justinian (527-565). The statue was made of gilded bronze, and stood on a column 50m. high. The most remarkable thing about the statue itself -- otherwise your basic equestrian statue -- was the headdress, called a toupha, which an earlier traveller drew in great detail in 1340 (right) and you can see that this drawing and Cyriaco's are pretty much in agreement.
. A number of different headdresses have been called the toupha, or toufa as you prefer, but we are currently concerned with the one on the statue, and will describe it a diadem with a lot of peacock feathers. It probably came from the East, perhaps Persia, which is an all-purpose explanation for various Byzantine appurtenances not otherwise explicable. 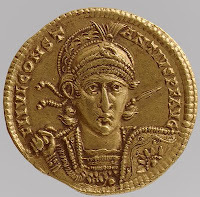 The toupha had been in use for quite a while before Justinian -- coins of Constantius II (337-361) like the gold here show him wearing one -- and notice the little thing in front that looks like the tuft on a hawk's hood. 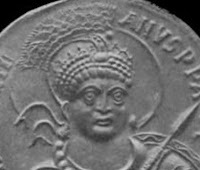 When Justinian came along, 200 years later, it was apparently well- established as part of the emperor outfit, regardless of how silly it must have looked, and was worn when an emperor rode in procession to celebrate a triumph. 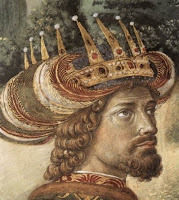 John VIII Palaiologos who gave so much pleasure to artists with his dramatic hats went to the Council of Ferrara-Florence in late 1437. 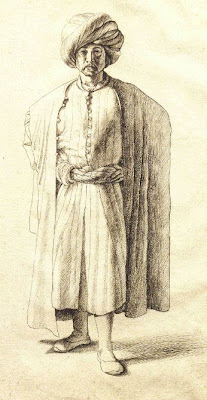 Now, Cyriaco who drew the first toupha pictured above, and who was a friend of John, was at the Council when it moved to Florence in early 1439. And the young painter Benozzo Gozzoli (1421-1497), being a Florentine, was there, too. John didn't wear a toupha in Florence. Florence was a humiliation, not a triumph, and if he had worn a toupha, there would be twice as many pictures of him wearing it as there are of him wearing the melon hat. But one can imagine a variety of ways in which a young painter might have met up with Cyriaco who had recently been in Constantinople, and might have looked at his travel notes and diaries. And might have seen that image of a mounted emperor wearing a toupha. 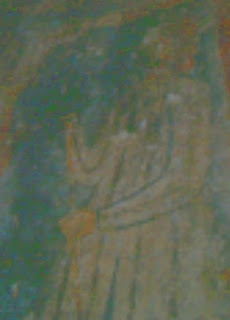 Or young Benozzo talked to other people who had been in Constantinople and or saw other drawing. He may have made his own copies of them. He may have thought that it was a silly headdress, too, and that he could improve on it. 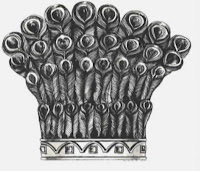 Or he may have only understood that it was a crown with feathers. So that when he came to paint his amazing frescos for the Capello dei Magi in the Palazzo Medici twenty years later, he included the emperor John, wearing carefully curled hair, exotic Eastern robes, imperial red buskins, and a toupha -- a crown bejewelled with the rubies and pearls which John is known to have worn in Florence, and with red, white, and green feathers. This is how Ag. Thomas looked in 1978 and this is how history happens. Ag. 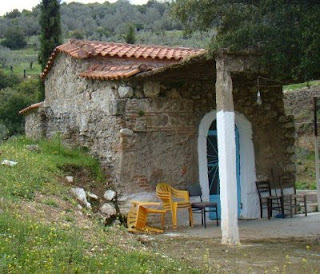 Thomas is a sweet small church, up many steps above the road leading to the archaeological site of Midea. 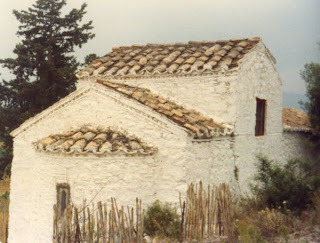 In 1978 it was surrounded by brush, its walls were rough though immaculately whitewashed, and in 1978 there was evidence on the exterior that it was built in the 13th century. For one thing, there was a dentil trim--corners of bricks barely visible in this picture -- along the roof line and across each side under the windows. For another, there were -- whitewashed over then -- crosses made of ceramic bowls over the windows on the north and south sides, like this bowl from the church of the Dormition of the Virgin at Merbaka-Ag. Triada which used to have 52 of these jewel-colored ornaments. Ag. Thomas had at least 12 making up the two crosses, and there may have been more. 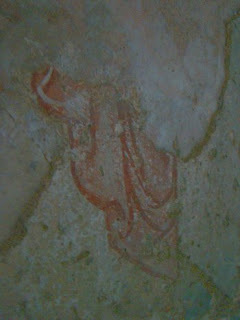 Inside the apse are remains of indecipherable frescos. The iconostasis was in 1978 and is now painted a splendid bright blue. At the base of the iconostasis is a hole -- recall that Thomas wanted to put his fingers into the hole in the Master's side for proof -- through which children were once, perhaps still are, passed for healing. What you see in the immaculate exterior, the clumsiness of the arches, the gaiety of the paint and the amateurishness of the icons is that this church is beloved by the people of its small village to whom it belongs. This may be the problem -- it certainly is a problem for archaeologists, art historians, and those who require history to be frozen for the buildings of their choice. 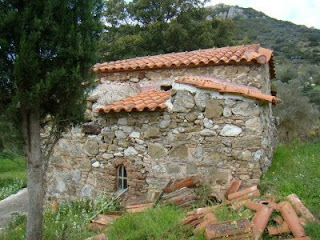 There is a great word here in Greece often seen on restored buildings, anapaliotheke -- "made old again" which is what happens to these medieval churches when they are officially discovered, fixed, and frozen. Ag. Thomas was not officially discovered and so in recent years, its village has done the fixing. The brush was cleared out and the pavement extended on the south side looking south to Midea and down the valley east to Nauplion and the sea. The porch roofs were sensibly enlarged and electricity put in. So far, so good. But then the uneven roof line was regularized -- the interior vault was left intact, but the walls on the east and west ends were raised a bit, and the center walls cut down to the tops of the windows. This eliminated the ceramic bowls that had survived for 700 and more years. The exterior of the church was replastered, eliminating any sign of dentil moldings, sizes and shapes of stones, and any other indications of age. The photographs of Ag. Thomas from 1978 and from 2009 are so unlike that anyone who has not been there may have to accept on faith that these are photographs of the same building. This new one is immaculate, well cared-for, and has nothing of its former appealing shabbiness. This is partially a class thing, this yearning for charm and shabbiness, this desire for the picturesque. The picturesque is generally a function of long-time poverty, and if there is anything people want when they no longer have to submit to poverty, it is to signal that is has gone. If you repair and paint your home, why not your church ? This is a problem for me as a historian: why should these remnants of the past, valuable to me as an outsider, one who neither pays taxes here nor helps whitewash -- why should the people to whom they belong maintain them for my satisfaction? Real vandalism has been done to several churches I know, particularly one on private property, but for a government agency to take over under the rationale of the value of "national heritage" may do violence to other values, and to individuals who already have a firm concept of their own heritage based on the information available to them. I particularly love the Saints Thomas: Thomas Apostle, Thomas Aquinas, Thomas Becket, Thomas More -- all in love with accuracy, even to the point of disaster. So I want to be accurate about Ag. Thomas-Midea: it has not been vandalized, it has been cared for by the people to whom it belongs. And it is accurate to say that this care has created loss for another community.